The point we're at now is having to buy large amounts of food to use up the small amounts of food that I am trying to get rid of. This is probably not the smartest or most economical way of going about it but I'm not the smartest or most economical guy so it all works out fine in the end. I have been purchasing most of the salad ingredients on a weekly basis. 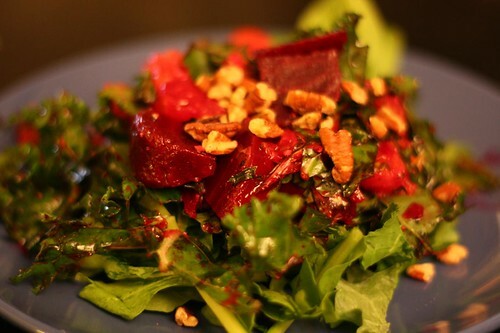 Tonight's salad was kale and arugula with beets, Page Mandarin, and chopped pecan with olive oil, salt, and pepper. 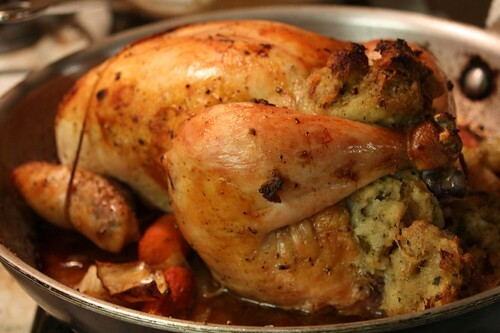 I used up the remaining stuffing from Canadian Thanksgiving by doing something I haven't done in a decade: stuffing it in a chicken and roasting it. 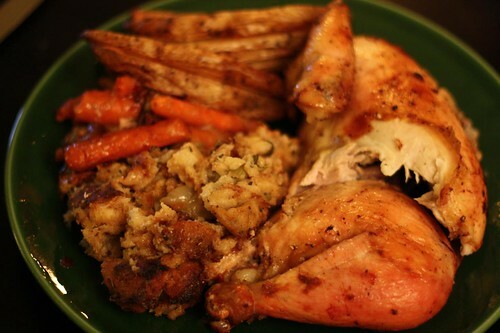 This is, after all, the most obvious application for stuffing -- hence its namesake. However, I'd been trying to think of more clever things to do with it but since I am dim this is the best I could come up with. What I came up with was a hastily stuffed and trussed chicken. Trussing is one of those things that I know how to do but I never have the patience to do. Sort of like baking. It turns out that it's also best to decide to truss before you start cooking your chicken. I decided after it had been searing in a pan for some time and I found it rather difficult to do. Also, I only had about twelve inches of twine left. I had wanted to make it into a turducken but I determined that making turducken for two would be a costly endeavor which would leave us with far too many leftovers. No matter. It turns out a stuffed chicken is delicious. Another culinary lesson learned! To accompany this I roasted some potato wedges in leftover duck fat from my roast duck a couple of weeks ago. The result was good but I'm not sure you could really tell they were roasted in duck fat. However, I know they were roasted in duck fat so I will sleep easy this evening. 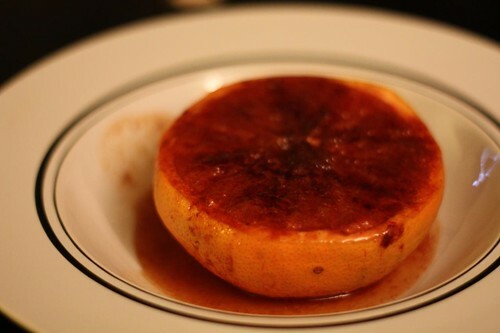 I had an experienced grapefruit on the counter so I segmented it, sprinkled it with brown sugar, butter, and cinnamon, then broiled it for 2 or 3 minutes. This was a nice dessert and an improvement over our normal plain yogurt with granola. A proper dessert is something we don't experience very often. Of course, I have a hard time believing it counts as dessert if there is not chocolate involved. But that is probably a personal failing of mine. Nothing that a few handfuls of chocolate chips can't fix.